For most of us, just one real letter in the mail is a red-letter day. But a trio of Danforth Tech alumni (the school became Danforth Collegiate and Technical Institute in the 1980s) get to read dozens of letters and postcards every Wednesday afternoon. Most are thank-you’s for things like socks, cigarettes or copies of the yearbook and newsletter. 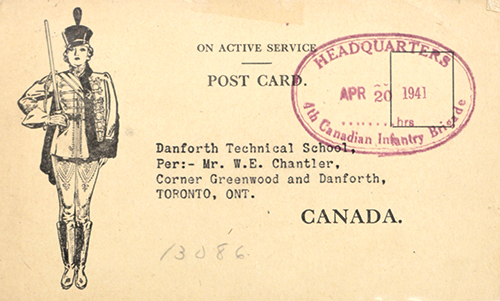 All the mail – a total of 400 post cards and 1,600 letters – was sent to the school by Danforth students, grads and staff while serving in the Second World War. “I don’t know how to put it really,” said Ron Passmore, a class of ‘64 grad who joined the project to better preserve and display the school’s wartime letters. In one letter, a former student tells how he introduced Danforth Technical School to a crew of Scottish fishermen. The young pilot was flying a twin-engine plane over the Atlantic when one engine cut out, forcing his three-man crew to ditch and get into a dinghy. Among the thank-you’s and light-hearted stories about bumping into classmates in London, England, the letters contain many tragic encounters, too. Bryan Bennett, who started the letters project two years ago, said students wrote back with news that a classmate had been injured or killed. Some were firsthand accounts. All told, 2,235 graduates and students of Danforth volunteered for active service in the war, along with teachers and staff. It was, as a memorial brick at Juno Beach now says, the greatest number of volunteers from any school in the British Commonwealth. Two hundred and forty one died in the war, including one woman, Maud Steane, who trained as a radio operator in Toronto despite laws that prohibited women from joining the Canadian or American merchant marine. Steane travelled to New York City where she found work on a Norwegian-flagged ship, which had no such prohibition. She was 28 when she died. Many others died younger, in their late teens or twenties, and enough were listed as 18 years old that they likely lied about their age when they volunteered. Danforth’s contribution to the war is well remembered. Roy Foley, a teacher and enlistment officer, led a war memorial committee that confirmed the military records of the surviving volunteers, and the grave sites – from Canada to Germany to Sri Lanka – of those who died. In 1948, the school opened its War Memorial Library, with four hand-lettered rolls naming the volunteers, two bronze plaques listing the fallen, and a dozen bright stained-glass windows designed by Cyril Travers, a long-time art teacher at the school. Since 1999, when alumni formed the Danforth Tech Society (and printed golf shirts with the same “D.T.S.” – initials the school had in their day), the society has funded several school projects, including a repair of the stained-glass windows, which had become warped by a heating outlet. 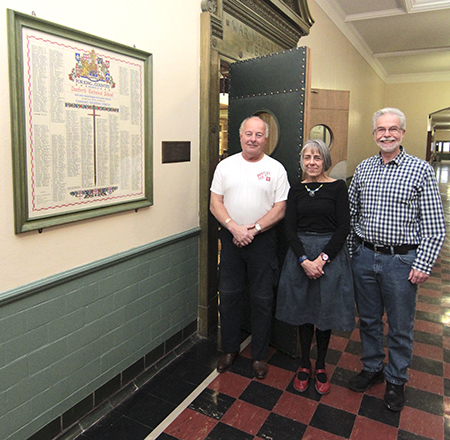 Danforth Tech alumni Bryan Bennett, left, and Ron Passmore, right, stand with librarian Barbara MacKay outside Danforth Collegiate and Technical Institute’s War Memorial Library on Jan. 15. 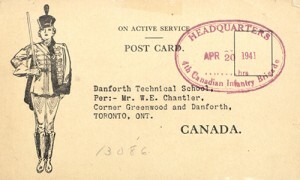 To celebrate the school’s 90th anniversary, the Danforth Tech Society will better preserve 1,600 letters and 400 postcards, such as the one pictured, below, mailed to the school by Danforth students, graduates and teachers who volunteered for active service in the second world war. At left, above, is one of four hand-lettered rolls listing the more than 2,200 volunteers. DTS president Gwen Vance said the alumni also supports current students in many ways. They fundraise for everything from volleyballs to football uniforms and kitchen equipment for the school’s well-known hospitality program. The DTS also supports some student awards. “It’s my favourite thing of the whole year, just to hear the stories of these kids as they go across the stage,” Vance said. In November, as part of the 90th anniversary, the DTS co-hosted a homecoming for the school’s football team, which restarted a few years ago after a long hiatus. “I was very glad to see it come back,” said Robert Howes, who refereed high school football for 20 years and played on Danforth’s senior football team back in the late fifties, when it had bantam, junior and senior teams and won three senior city championships. Howes’ 1950s team jacket, which still fits, he said, is now on display in a showcase in the school. The shooting target Howes kept from the school’s basement rifle range, which is now closed, is still at home. Bennett said the society still has a ways to go before the wartime letters go on display. So far, all but a few have been identified and sorted, and, significantly, they are now stored in a fireproof safe. Bennett and Passmore, who both graduated from Danforth’s printmaking program, are now making high-quality copies that will be bound into books so that families, friends and fellow veterans can have a look at the letters. As they finish what might be their longest homework assignment at Danforth, the alumni have found many things worthy of safekeeping. One is a binder full of news clippings about the war service of the Danforth volunteers, carefully compiled by Edyth Howison, the school secretary at Danforth from 1931 to 1963. Thanks to people like Howison and school librarian Barbara MacKay, letters sent to the school some 75 years ago can still surprise people today. Passmore’s father and three of his uncles all went to Danforth during the war. Three were in the navy, one in the artillery, and all made it home. While working on the project, Passmore came across two letters by his father. He wrote them in 1942, when he was 27 years old. “It was a moment, I’ll tell you that,” he said. Anyone interested in helping the archive project or joining the Danforth Tech Society can email danforthtechsociety@gmail.com or visit danforthcti.com. My parents Lang Cope and Daisy (Skelton) Cope are both high school graduates of Danforth Tech in 1951/52. My Mom grew up on Langley Ave and married a Langley, how coincidental is that. All my life I heard so much about “The Danforth” area and their high school DTC. They were married at a church on First, which Dad told me he cleaned the snow for the Minister to help pay for Mom’s singing lessons. I know they both attended different events over the years at DTC, even when Dad moved us out to Port Perry. My mother, Daisy, went on to Ryerson after DTC and took fashion and design. Daisy still lives in Whitby where Mom and Dad lived since 1993. Lang was a great football player for DTC and Rugger Player for the BBCC. He had the opportunity to play Football shortly for the Argonaut’s in the early 1950’s. He was an avid paddler and taught us all how to Paddle a C1, K1 and even in a warcanoe. My Dad passed away in 2011 and miss him everyday. I recently had the opportunity to return to “The Danforth” with a business proposition and it brought back so many memories of my parents youth. The comfort of the area from my parents made me confident to act on purchasing the business. So I looked up Danforth Tech and found this Society and thought I would share how much I know the school meant to them. Without DTC they would have never had married and therefore nor would I be writing this email. Sorry for the long delay in responding to your question about an art teacher at Danforth Tech named Mr. Passmore. To the best of my knowledge I am not related to him. My Dad was in the printing industry, but thanks for asking just the same. What a great story! I attended Danforth Tech (from East York) between 1963 and 1966 before going on to Ryerson. It was a great school and I also remember Hec Creighton as my phys ed teacher (fellow students will remember the Battle of Britain films) and of course the CFL trophy named after him. This is a tremendous project remembering all those young men who served in WWII. Congratulations to the DTS alumni and staff for a job well done. I’m writing to tell you of Leonard Wilson who attended DTS from 1951 to 1955. He is in Pallative Care at a Toronto Hospital. I spoke to him today about his high school years and he was so happy to talk about learning to play trumpet at the school and being a member of the school band. Music teachers give kids a gift that lasts for life. Leonard played in several bands after graduation for the sheer pleasure of playing the instrument. Besides playing the trumpet Leonard became a Commercial Artist thanks to his training at the school. The happiness on his face just talking about his high school years was something to behold. On his behalf I would like to thank all the teachers who had a part in Leonards life. Hello—I attended “Tech” from 1954/5 to 1957/8 graduating from the printing program and worked a couple of years in the industry before returning to West Hill CI for Gr. XIII. I remember the entire “Tech” staff as “All Star” teachers giving me academic training and confidence to tackle and earn “Firsts” in the “Provincials” in most upper school subjects, particularly algebra, geometry, trigonometry, and physics where I seemed to have better prep in these technical subjects than students who attended only Collegiate High School Programs. I then became a teacher graduating from Arts, Queen’s University and Masters Degree at U of T. I was employed by the Scarborough Board of Education in 1962, taught geography, math, and science as a specialty subject senor school teacher, promoted to VP in 1968 and principal in 1972 and retired in 1996 after 24 years as principal of 6 different schools and about 6 years on the executive of the Ontario Principal’s Association and a former Mulroney Federal Candidate in a 1990 byelection and thus one of the first two Federal PC candidates that had to publicly support Free Trade and the GST in an election.